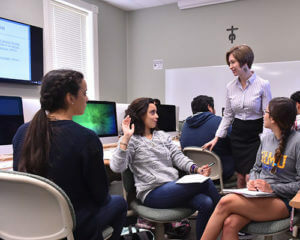 Spanish at St. Mary’s University gives students a rich view of the world, where they will learn more about the second most-spoken language in the United States. They will be able to read and enjoy important literature produced in the Western world in its original language. Fluently speaking Spanish is a desired skill that can be a powerful tool in many professional. The Spanish program at St. Mary’s is one of the oldest at the University. Its roots come from the international education character of the Marianist Order, which has schools and universities not only throughout the United States, but in Latin America, Europe, Africa and Asia. Several scholarship options are available for students majoring in Spanish, (B.A. or B.A. with Teacher Certification) in the last semester of their junior year, or to those in the first semester of their senior year. All scholarships are given annually in the spring semester and funds are posted in the students accounts in the fall. For information about scholarship deadlines, contact Eva Bueno, Ph.D., Department Chair, at ebueno@stmarytx.edu or 210-436-3738 or visit her office in Reinbolt Hall, Room 314. Explore our scholarship opportunities below. This fund was established by an anonymous donor to benefit Spanish majors (B.A. or B.A. with Teacher Certification). Write to the chair of the Department of Languages to indicate your intention to participate. Write an essay about why you chose to study Spanish or why you chose to be a Spanish teacher. The essay should include a reflection about how a course of study at St. Mary’s has helped shape your professional and personal views. Personally deliver your essay and an unofficial copy of your transcript. Contact Eva Bueno, Ph.D., Department Chair, at ebueno@stmarytx.edu or 210-436-3738 or visit her office in Reinbolt Hall, Room 314, for more information on the specific requirements for the application and deadline. This award was created by Robert Ballinger and is wife Ginny Ballinger. Both Mr. and Mrs. Ballinger have been teachers all their lives. Mr. Ballinger has always had deep connections with the Marianists, and he worked at Worthington, Ohio, as a teacher of French and English. While at Worthington, he developed the French program and eventually taught this language full time. Mrs. Ballinger, who has a doctorate in Education Curriculum, Instruction, and Professional Development from the Ohio State University, taught Spanish at Upper Arlington, was chair of her school’s Global Languages Department, and was appointed State Curriculum Consultant for Foreign Languages at the Ohio Department of Education from 1993 to 2000, when she retired. Both Mr. and Mrs. Ballinger were very active in their state association of language Teachers (Ohio Foreign Language Association), and were each elected as OFLA’s presidents (Mrs. Ballinger 1993-1994, and Mr. Ballinger 2000-2001). It is a great honor for our Department of Languages at St. Mary’s University to be associated with and beneficiaries of such a fine example of love for teaching and, more specifically, love for teaching languages. We are very grateful to Mr. and Mrs. Ballinger for their generosity in establishing this award that benefits our students. The award of up to $3,000 is to be given to a foreign language major with a minimum GPA of 3.2 and demonstrated financial need. Students in their last semester of their junior year, or the first semester of their senior year are eligible. Preference will be given first to a language student interested in becoming a foreign language teacher, then to a foreign language major, and if no qualified candidate exists, to a student seeking teacher certification in any field. Write a three-page essay in English or in Spanish, explaining why you has decided to study Spanish. For those seeking a degree with Teacher Certificate, make sure to write about your plans for a career in teaching. Personally deliver your essay and an unofficial copy of your transcript in an envelope by the deadline.